Codin has more than 15 years of experience in banking and management consulting. His main areas of expertise cover Enterprise BPM, Process Architecture & Improvement, Lean Management, Customer Experience Design. Organizational Design, Innovation and Performance Management. He worked for Ernst & Young, leading Human Capital related projects and due diligences for oil & gas companies. 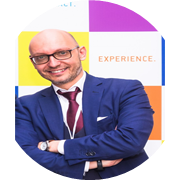 In 2005 he joined OTP Bank, the largest Hungarian bank, as Head of BPM Department with main responsibility of creating a BPM framework and running efficiency programs across the bank. He also worked for Volksbank, an Austrian bank, as Head of Process Excellence and Change Management. Since 2013, Codin joined Riyad Bank, one of the leading banks in Saudi Arabia and GCC area, as Senior Vice President, Head of BPM Centre of Excellence..
Codin has a Diploma and Master degree in Management. He is also a Lean Six Sigma black belt. He is a frequent speaker and publisher for his expertise areas and enjoys challenging different organizational management practices for the benefits of the final beneficiary, the customer. He advocates upon designing the organization around the successful customer outcome, removing the silos and hierarchies, hiring characters and building skills and expertise for champions around the organization, leading by example based on inspiring, transparency, integrity and mutual trust. He is happily married, sport practitioner, heavy traveler, gourmet and art collector. Check out the incredible speaker line-up to see who will be joining Codin.